Timing can be everything when it comes to when fixtures are scheduled and it’s always been a factor in the Pro 12. A new season has also brought additional challenges with an uneven number of home games for teams and trips to South Africa to consider. On Top Of The Moon takes a look at how Glasgow’s calendar is shaping up. The way the season is set up means that Dave Rennie’s troops have to hit the ground running. Both of Conference A’s other top 6 sides from last season’s Pro 12 (Munster and Ospreys) will visit Scotstoun in the opening block of fixtures. Games like this will have increased significance at the end of the season as it’s these sides that the Warriors’ finishing position is most likely to be measured against in the final reckoning. The Cheetahs away fixture is a hard one to judge. Acclimatising in the short period of time available seems an impossibility. There’s also a risk that the change in conditions allied to the travel involved could compromise the side’s preparation for their opening Champions Cup fixture against Exeter. So does Dave Rennie prioritise and manage his assets? If opening night in Europe had been at home (and therefore a must win fixture) he may have opted to send a completely second-string squad to Bloemfontein. As it is he may still use that weekend to fulfill rest protocols for key Scotland players to maximise the games he can get out of them elsewhere. A win at Sandy Park might be a bonus – but if the side are to have any opportunity for progression they almost certainly need at least one away win so they need to attack all 3 trips to their Pool 3 opponents to maximise their chances of making the quarter finals. There then follows a 3 game home stand which could set the side up very nicely for the Autumn break. Leinster will be no mugs though, especially in European competition and the Warriors will need to be a little more streetwise than they were against Munster in this tournament last season. The league match against the Dubliners will come with its own set of difficulties – normal practice has seen Scotland players rested the week prior to the first Autumn Test. There may be some interesting conversations with Gregor Townsend about who he can spare (especially given that the opening international is against Samoa). The Ospreys away game falls into an international window for the third successive year (this should surely be one of the big cross border rivalries of a Pro 14 campaign but scheduling like this makes a mockery of it – last season there were 20 Warriors and Ospreys playing in the Scotland v Wales match on the Saturday rather than the club game on the Sunday). From Glasgow’s point of view it’s not ideal but the Os themselves will be weakened and given this would be a low percentage fixture for an away win at any time of the season then anything picked up at the Liberty Stadium can be seen as a bonus. Strong home form needs to be maintained against Cardiff Blues ahead of 4 games that will have a significant impact on the shape of Glasgow’s season. First up it’s Montpellier with the home fixture first. Until recently the Warriors had a pretty poor record in these December European matches but they won back to games against Scarlets in 2015/16 and repeated the dose versus Racing 92 last season. With just 3 wins on French soil in the history of the tournament Glasgow will have their work cut out when they visit Vern Cotter’s new club – but they can think back to Paris last season and also their most recent visit to Montpellier in 2014 when they came away with the points after a backs to the wall performance. There has been a school of thought that the Warriors will benefit from having to play Edinburgh 3 times in the 2016/17 season given the capital club’s consistent position in the bottom third of the Pro 12 table. A quick glance at Glasgow’s record against their local rivals is enough to show that normal form goes out the window in these derby matches though. Across the Gregor Townsend era the Warriors only picked up 1 more point against Edinburgh than they did against Leinster. That being said these are still games that Glasgow have to target for wins if they are serious about being Pro 14 playoff contenders and pushing on to get a home quarter-final or semi-final. Zebre away should provide a chance to rest some key players ahead of more European action. The near miss against Treviso last Hogmanay should serve as all the warning that is needed however about the perils of taking the foot off the gas too much. Back on European duty and on their travels again, the Warriors will know that any trip to Dublin is fraught with difficulty – it was the only Pro 12 away trip that Gregor Townsend didn’t taste victory in. Glasgow simply cannot afford to be in a situation where they must take something from the game at Leinster to stay alive in the pool. They will at least have the benefit of finishing their European pool in Glasgow. It will have been a decade since the club last faced a Round 6 match at home with something riding on it. Not since Saracens came to Firhill in 2008 have the Warriors’ faithful had the opportunity to try and cheer their men on to a European quarter final. If qualification is still a possibility the atmosphere for the game against Exeter should be electric. The Six Nations will provide its usual challenge for Glasgow. There’s no room to write these fixtures off completely – the Dragons are the number 2 target for an away win that will need to be achieved without the full contingent of players involved with Scotland (and Italy) on the same weekend. The Cheetahs (who will be a on a month long tour of the UK and Ireland) have to be dispatched at Scotstoun. After that there are another 2 games which would normally be a rare source of wins under any circumstances with away trips to face Munster and Ulster. Similar to the Ospreys fixture in the Autumn the mentality here can be go out, give it a bash and any points taken are an unexpected extra. This maybe gives the players the opportunity to relax and express themselves – and possibly even find a way to cause an upset. The Warriors have certainly had worse run ins to the season but even still, after Zebre visit (probably with a number of key internationals rested by Dave Rennie) there are 3 challenging games with the only one within Conference A being the home tie versus Connacht. Glasgow have struggled in Llanelli in recent years – although a couple of their defeats to the Scarlets came during Test windows and it will be nice to see a full strength side travelling to Wales for a change. That last match against Edinburgh could well be crucial. The lack of travel is beneficial for preparation but the Warriors’ record at Murrayfield is still pretty mixed. 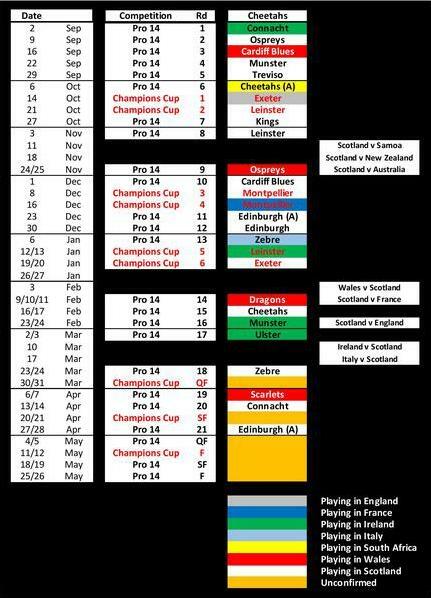 If all goes to plan and Glasgow make the post season the updated structure makes for some interesting new challenges to overcome. A side finishing 2nd or 3rd in their pool will need to win 3 games in a row to take the title, with the bottom seeds having to win back to back matches on the road just to reach the final. On the flip side the top seeds will have the advantage of one less game but the timing of the Champions Cup final means they will have a full 3 weeks between matches. This may well be a recipe for rustiness and getting caught cold early in those playoff semi-finals.